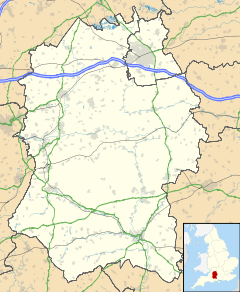 Draycot Cerne (Draycott) is a small village and former civil parish in Wiltshire, England, about 3 miles (5 km) north of Chippenham. The parish was referred to as (Medieval Latin:) Draicote in the ancient Domesday hundred of Startley when Geoffrey de Venoix ("the Marshal") was lord and tenant-in-chief in 1086. The morpheme dray is common in England's place names, yet unused elsewhere in the English language, so is considered an ancient Celtic word. By the 14th century, the old village was known as Draycot Cerne, in part to differentiate it from similarly named villages in other areas of England. The suffix Cerne is the French surname of the lords of the manor. The ancient parish of Draycot Cerne comprised three manors: Draycot Cerne, Knabwell (or Nables) and a detached part at Avon, near Kellaways. The old village of Draycot Cerne (also known in the 19th century as Lower Draycot), close to the church and Draycot House, was removed by Henry Wellesley, 1st Earl Cowley after 1865 and Upper Draycot was renamed Draycot Cerne. All of the cottages and farms of Draycot Cerne were on the Draycot Estate, belonging to Draycot House. The parish of Draycot Cerne, together with Seagry parish to its north, was added to Sutton Benger civil parish in 1934. In 1971 all land north of the newly built M4 motorway, including part of the former Draycot parish, was transferred to a recreated Seagry parish. It is possible that Draycot Cerne lent its name to the town of Dracut, incorporated in 1701 in Massachusetts. St James's Church was built around 1260. It is now in the care of the Churches Conservation Trust. The benefice was united with Seagry in 1939 but in 1954 the union was dissolved, and for church purposes the village is now within the parish of Kington Langley. A medieval manor has occupied the site since the 14th century. Old Draycot House was probably built for John Long in the mid 15th century. The house was extensively re-modelled, over the years, by the Long family. In 1773–75 Sir James Tylney-Long (1736-1794) added a new south front, and east and west wings around the core of the medieval manor. Further work was undertaken in 1864, after Lord Cowley's inheritance. The house was demolished in 1952-4. Between 1412 and 1610, the Long family held Draycot House jointly with South Wraxall Manor, near Bradford-on-Avon, Wiltshire. The Draycot Estate covered 4300 acres at its maximum extent, covering the whole of Draycot Cerne, Kellaways, Sutton Benger and Seagry, parts of Startley, Little Somerford, Christian Malford and Kington Langley. It was the main land-holding of the Tylney-Long baronets in Wiltshire. Part of North Bradley, Wiltshire. Wanstead House, Wanstead Park, Wanstead Manor, the Aldersbrook Estate and the greater Wanstead and South Woodford Estate, including most of the London Borough of Walthamstow (after 1784), Essex. 1830 acres. Rochford Hall Estate, SE Essex (after 1784). 4961 acres. Felstead, Halstead and the North Essex Estate (after 1784). 3760 acres. Roydon Hall Estate, Roydon, Essex with High Ongar and Fyfield, Essex (after 1784). 2598 acres. Old Tylney Hall Estate, Rotherwick, Hampshire (after 1784). 2762 acres. Athelhampton Manor and land in Dorset. 1700 acres. Land at Kirby Hill, Harrogate, Cundall, North Yorkshire with Leckby etc. North Yorkshire, formerly the northern part of the Royal Forest of Galtres. 4400 acres. Higham Park, Northamptonshire. 600 acres. The St Ives, Cornwall Estate (after 1820). John Buckeridge (c. 1562–1631), theologian. Born in Draycot Cerne. John Aubrey (12 March 1626 – 7 June 1697), an English antiquary, natural philosopher and writer, was a frequent visitor to old Draycot House. His biography, by Ruth Scurr, was illustrated on the front cover with a watercolour of Aubrey and Sir James Long, 2nd Baronet of Draycot hunting together. Some of the correspondence between Aubrey and Sir James Long, at the Bodleian Library, is published in Early Modern Letters Online. Other letters were directed to Aubrey via Robert Hooke at Gresham College. John Britton (antiquary) (1771-1857) was educated at Draycot House school, although he later complained about the quality of the teaching. Francis Kilvert (3 December 1840 – 23 September 1879), the diarist, was a frequent visitor to Draycot Cerne, when he was in Wiltshire. Henry Wellesley, 1st Earl Cowley inherited the former Long family estate of Draycot Cerne, in 1863, from his cousin the 5th Earl of Mornington, and he lived there in retirement until his death on 15 July 1884. Prince Franz von Hatzfeldt-Wildenburg of the House of Hatzfeld and his wife, Clara, leased Draycot House between 1896 and 1915. He was the owner of Ascetic's Silver, the winner of the 1906 Grand National. She was the adopted daughter of the American billionaire Collis Potter Huntington. ^ The Place Names of Wiltshire (English Place-Name Society), pp. 69-70, 72-73. ^ 1911 Encyclopedia Britannica, Vol. 23, page 862. ^ a b c d "Victoria County History - Wiltshire - Vol 14 pp75-82 - Parishes: Draycot Cerne". British History Online. University of London. Retrieved 22 May 2015. ^ "St James' Church, Draycot Cerne, Wiltshire". The Churches Conservation Trust. Retrieved 29 May 2017. ^ "No. 34643". The London Gazette. 7 July 1939. p. 4652. ^ "No. 40149". The London Gazette. 16 April 1954. pp. 2286–2287. ^ Bodleian Library Ref MS Aubrey 12 ff. 267-268. July 16th 1676. This page was last edited on 15 January 2019, at 17:40 (UTC).